The iconic Wanderers, Johannesburg will host the 2nd T20 between South Africa and Pakistan on Sunday. The hosts got off to a winning start in the first game in a close encounter. They now have the opportunity to seal the series. On the other hand, it’s a do-or-die situation for the visitors. Keep reading to find out South Africa vs Pakistan 2nd T20 Match Prediction. In the last game, the batsmen enjoyed a great time on a batting-friendly surface. South Africa, batting first, was well on course for a 200-plus total on the back of 70-plus scores from Reeza Hendricks and Faf du Plessis. But Pakistan dragged things back and restricted the opposition to 192/6. Pakistan was well in line to chase the target when Babar Azam and Hussain Talat added 81 runs for the 2nd wicket. But David Miller was the star of the show, not with the ball but with the field. He took 4 catches and inflicted 2 run-outs that halted Pakistan to 186/9. Shoaib Malik’s 49 went in vain as Miller claimed the Man of the Match purely for his fielding efforts. 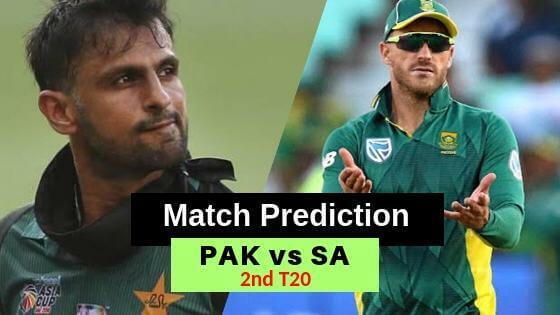 South Africa vs Pakistan 2nd T20 Match Prediction: The No.1 T20 team in the world shouldn’t go down 2 in 2. The Men in Green, going by their form in the shortest format of the game, would most likely make a comeback.